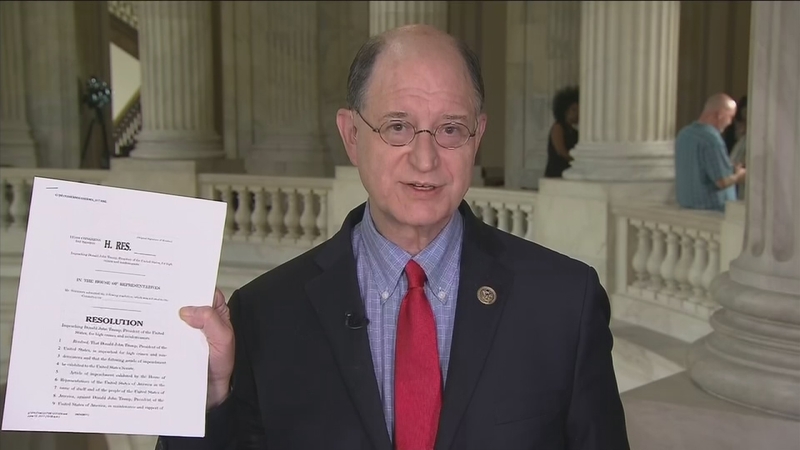 WASHINGTON -- Rep. Brad Sherman, D-Sherman Oaks, announced Wednesday that he and another congressman have filed an article of impeachment against President Donald Trump. Fellow Democrat Congressman Al Green of Texas co-sponsored the article. Sherman announced plans to file the articles in June, saying Trump obstructed justice in the Russia investigation. In a statement released on Wednesday, Sherman mentioned the recent news of Donald Trump Jr. and his email exchange regarding a meeting with a Russian attorney who claimed to have incriminating information about Hillary Clinton. "Recent disclosures by Donald Trump Jr. indicate that Trump's campaign was eager to receive assistance from Russia. It now seems likely that the President had something to hide when he tried to curtail the investigation of National Security Advisor Michael Flynn and the wider Russian probe. I believe his conversations with, and subsequent firing of, FBI Director James Comey constitute Obstruction of Justice," Sherman said in the statement. Sherman's impeachment article states that Trump should be impeached due to "high crimes and misdemeanors." The U.S. Constitution says that a president can be impeached for committing "high crimes and misdemeanors." In his statement, Sherman described Trump as "America's amateur president," who demonstrates "ignorance accompanied by a refusal to learn." "We're no longer surprised by any action, no matter how far below the dignity of the office-and no matter how dangerous to the country," Sherman said. As for what's next, Sherman said he will now begin trying to "force the House Judiciary Committee to hold hearings on Obstruction of Justice and Russian interference in our election." He admitted that filing the article is "the first step on a very long road." "I am introducing Articles of Impeachment to begin a long process to protect our country from abuse of power, obstruction of justice, and impulsive, ignorant incompetence," Sherman said. Democratic leaders have distanced themselves from the effort, believing it energizes Trump's base. Fifty percent of the House of Representatives and two-thirds of the Senate must agree to remove a president from office.